Marianas Trench in Montreal or Quebec City? 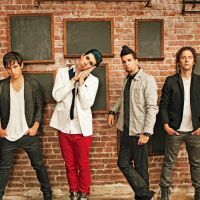 Inform me about the next events for Marianas Trench. Enroll yourself to our priority waiting list for Marianas Trench to be alerted when new tickets are available. Filling this form doesn't engage you to any purchase. Marianas Trench is a band from Vancouver that came together in 2002. The band has two certified platnium albums, Masterpiece Theater and Ever After. They've been given many awards, even a JUNO Award in 2013 for Group of the Year. We even saw them during the Vancouver Winter Olympics in 2010. They've toured Canada, United States and the world has headliners. Marianas Trench will be at Capitole de Québec for their new album, Astoria, in November 2015.